Ugly Americans: Apocalypsegeddon is an odd beast. On the one hand, it is very much inspired by arcade beat ’em ups such as Teenage Mutant Ninja Turtles and Double Dragon. Like those game you travel from one side of the screen to the other with an isometric point of view of the environment while dispatching countless foes. On the other hand it plays more like dual joystick shooters such as Geometry Wars. You move with the right analog stick, aim and shoot with the left analog stick and have an area of effect attack mapped to the right trigger. While the potential of this combination could lead to some fantastic gameplay, Apocalypsegeddon never quite lives up to either game type that it draws from. Instead, we are left with a game that often ends up being a repetitive exercise in pushing right with one analog stick, aiming with the other and occasionally pulling the right trigger, but not much else. In Ugly Americans you play as a character from the Comedy Central show of the same name. The roster includes Mark, Leonard, Grimes and Callie. Each of the characters plays somewhat differently but are largely the same across the board. The main difference between the characters is that Mark has the highest chances of critical hits, Leonard’s special attack recharges the fastest, Grimes is the toughest and Callie is the fastest. You pick up new weapons, or more specifically ammo types, as you progress through the story. Some ammo types seek out enemies, others fire rapidly and others shoot in wide spreads. No type is limited to a particular character but some are more useful with certain characters. For example, fiery ammo types become more powerful in Callie’s hands than others’. In addition to the different ammo types, each character also has a special attack. Both Callie and Leonard emit a type of radial blast that damages enemies while Mark can stun enemies near him. Grimes, whose special attack is the most interesting, transforms into a mulleted and Fu Manchued version of himself with a giant Gatling gun. Witnessing this is possibly the best part of the game. There are also pickups that passively affect your character. Energy drinks make you faster, decrease damage done to you or increase the damage you do for a short time. Demonic babies can be found in the environment that permanently give you one of these same buffs or multiply the experience you receive. While this may sound like it would be plenty to keep the action entertaining, each level boils down to moving from left to right while shooting aimlessly. And shoot aimlessly you must as the game has no sort of targeting reticle. The best way to judge where you are aiming is by looking at the stream of projectiles you are shooting. This essentially throws accuracy and skill out the window as all of your shots are, no pun intended, hit or miss. Good thing you have unlimited ammo. The game does employ an RPG-like leveling up system but nothing changes in a notable way. You simply get faster, stronger and so on. But this progression is key to finishing the game as it is a difficult one. The game has online and local co-op and expects you to take advantage of that. While the first three or four levels may seem like a breeze, the game sharply increases the difficulty after that. The good news is that you can go back and replay completed levels to gain experience and dying does not mean you lose you experience. If you level up and then die, you get to keep that progression. One annoyance with the leveling system is that you must either die or complete a mission in order to apply the experience you earn. There is no in-mission screen to attribute your experience and neither can you do so from any screen but the one that immediately follows a mission. This makes sense in a co-op situation, as you do not want any one player bogging down the action by constantly pausing to upgrade. But if you are playing the game by yourself, it seems like you should be able to upgrade as you play considering you may level up multiple times within a single mission. There is also a scoring system tied to a combat multiplier that goes up the more enemies you kill and the more cash you pick up. Getting hit both knocks you down physically and by one level of multiplication, but the scoring has no effect on leveling up, only leaderboards. Graphically, Ugly Americans looks just like its namesake. It is cell shaded and cartoony, which is good considering it is based on a cartoon. There is an inelegant nature to the presentation of the game however. The heads up display bares no semblance to how HUDs have changed throughout the years and is pretty ugly. It is functional and does not clutter the screen but is simply not pleasing to look at. Ultimately, whether you like the graphics of the game will depend on what you think of the show’s art style. To put it bluntly, I did not enjoy Apocalypsegeddon. The game is not broken or particularly unpolished, it simply feels uninspired, relying too heavily on you playing it cooperatively and enjoying the source material. The game is incredibly repetitive but can be less so when there are four people playing. At that point it becomes incredibly chaotic to the point that there are so many enemies on screen that you cannot tell when you kill one. Red damage numbers literally fly into the air all over the screen. So if you love the show and have three buddies who do too, this game could potentially be fun for you. 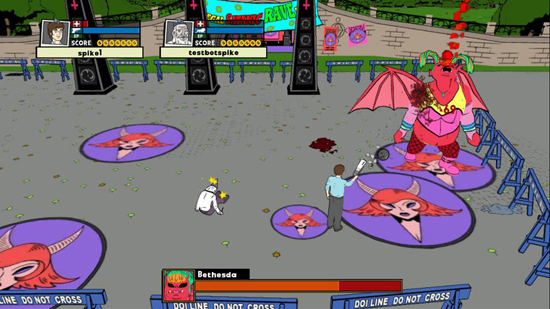 Ugly Americans: Apocalypsegeddon has some potential and is definitely not the worst game based on a television show but is far from being a quality game in its own right. Being based on a TV show or not cannot be the yardstick by which we judge games. That is basically the like saying a game has decent graphics…for a Wii game. Everything about Apocalypsegeddon really comes down to whether you like the show and have friends to play it with who love it too. If either of these criteria are lacking, I cannot recommend Ugly Americans: Apocalypsegeddon. It is merely too tedious an experience for all but the most devout.